Horror is evolving as a genre. Although your local multiplex is still peppered with the usual contenders, look a bit closer and you’ll find the latest drama, thriller, or crime offering is closer to horror than you might expect. In this bi-weekly series, Joey Keogh presents a film not generally classified as horror and argues why it exhibits the qualities of a great flight flick, and therefore deserves the attention of fans as an example of Not Quite Horror. This week, it’s Prisoners, Denis Villeneuve’s twisty, turny and altogether quite maze-like tale of child abduction and the limits good people are pushed to in the most difficult circumstances. In this day and age, where most of us can barely keep our attention focused on a YouTube clip for five minutes, a two-and-a-half-hour-plus movie is a hard sell. Keeping that in mind, French-Canadian director and soon to be king of Not Quite Horror Denis Villeneuve wastes no time (maybe fifteen minutes of screen time) establishing some happy family dynamics before ruthlessly tearing everything apart. Opening with a whispered “Our Father” and an establishing shot of a snow-covered forest, a wandering deer is picked off without a second thought by a proud father and son team on a bonding expedition, setting into motion Villeneuve’s themes of family, obsession and the lengths a parent will go to in order to protect a child. As such, Prisoners deals primarily with the abduction of two young girls and the subsequent struggle to locate them before the worst happens. Villeneuve has gathered a top-notch cast of high-profile actors to sell us on his film’s hard-to-swallow central conceit, communicated mostly in its quieter moments, of which there are many. Although it did decent box office returns, Prisoners is the kind of movie where characters speak in hushed tones, forcing the audience to pay closer attention lest we miss a crucial detail. The thing is, essentially, a mystery told in real time, the seconds ticking by as the kids spend longer and longer away from their parents. Heading up the team of worriers are a tortured Terrence Howard and a never-better Hugh Jackman, whose manic, wild-eyed Wolverine skills come in handy as his distressed father edges closer and closer to madness. Jake Gyllenhaal, who worked with the director on another Not Quite Horror offering, Enemy, plays a mixture of his characters from Zodiac and Nightcrawler as a wiry cop who’s never lost a case (and isn’t about to start now, damn it). 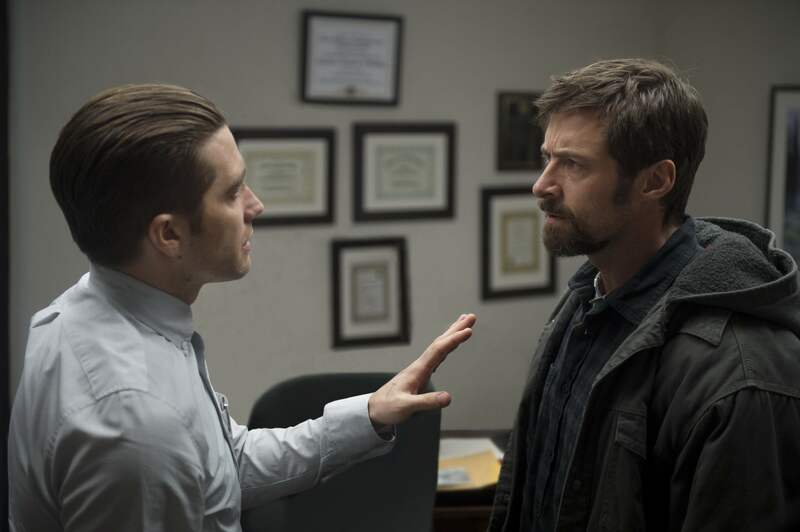 Chewing it up in the kind of role he relishes, Gyllenhaal’s cop is a ticking time bomb, the seasoned actor even blinking weirdly to establish how unhinged this guy is, how he isn’t about to give up without killing himself first. Meanwhile, Melissa Leo is unrecognisable in unflattering old-lady garb while Paul Dano is his twitchy best as the kind of character he can play he in his sleep–only this time, his innocence is queasily unclear throughout. Dano is involved in some of Prisoners‘ most violent sequences, the kind that, presumably, got the film slapped with an NC-17 certificate when it was first submitted to the MPAA (there were also allusions to paedophilia that were stripped back to obtain an R). These moments, during which Jackman’s character holds Dano’s prisoner and tortures him, are difficult not just for their intensity, but because Villeneuve is asking us to empathise with the father’s struggle and to try to understand his motivations. Prisoners has a heavy atmosphere that weighs down on you in the same way the pressure to locate the missing children before it’s too late weighs down on the parents. We piece the puzzle together alongside Gyllenhaal’s cop, each day adding more layers to the mystery. There are so many dead ends that it becomes impossible not to question everyone’s motivations. The question of whether Dano’s Alex is guilty or just mentally unstable hangs over everything, whether during the interrogation sequences (Villeneuve loves a good interrogation sequence, see: Sicario for more of the same), the horribly quiet moments between he and Jackman in the abandoned house in which he’s holding him, and in every moment without any clues to the kids’ whereabouts. A grisly discovery in a priest’s basement could be a red herring, or it could be the key to everything. Likewise, a load of snakes, soiled clothing and some buried mannequins provide yet more cloudiness amidst Villeneuve’s dark, foggy, rain-soaked pallette. The imagery is clear (the rain stars hammering down the moment the parents realise the kids are missing), while the suggestion of something lurking just on the periphery is established by glimpses of a dirty RV parked just in the corner of the frame, the same vehicle that may or may not be the key to unlocking everything. Villeneuve plays with our most basic fears, while simultaneously questioning our ability to trust everything and everyone around us–our belief that our safety is guaranteed. Roger Deakins’s harsh, gorgeously dark cinematography captures a tight-knit, yet oddly isolated, community perfectly while Jóhann Jóhannsson’s stripped-back score has hints of violin but doesn’t drift into maudlin territory when the tension mounts to breaking point. The religious overtones are a bit heavy-handed, particularly towards the end, but all things considered Prisoners is a remarkably restrained piece of work, especially given its tough subject matter. Villeneuve has proven time and again that he knows how to stage creepy scenes without resorting to typical horror tropes. He pulls in the multiplex crowd with words like “thriller” and “crime” and well-known actors we think we can trust like pre-Nightcrawler Gyllenhaal and the downright wholesome Hugh Jackman. Made between Enemy and Sicario, Prisoners represents an interesting moment in the director’s career. Neither as odd as the former nor as brutally bleak as the latter, the flick ends on a kind-of high note that, reportedly, was smudged ever so slightly to remove vagueness after its original incarnation was deemed too bleak. The result is strangely unsatisfying as, after over 150 minutes of tension with absolutely no let-up whatsoever, one would almost prefer Villeneuve to go with his gut and not give us the happy ending we think we deserve. Thankfully, Sicario came next and with it his Not Quite Horror reign of terror continued.